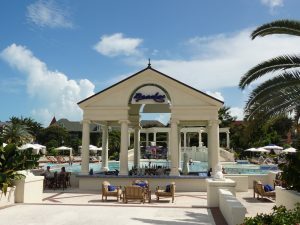 Beaches Turks & Caicos update 12/1/17 | Bethany Travel Dream Vacations, Inc. I attended a meeting this afternoon with updates on the re-opening of Beaches Turks & Caicos on December 14, 2017. Over 1800 team members have been on resort for the last 90 days working with contractors after the damages from Hurricane Irma in September. I was happy to hear that the resort will be re-opening on December 14th at 101% per Jamie McAnally, the resort’s general manager, seems he has some surprises in store for the re-opening! I was also informed that the island of Providenciales and the airport are in great shape and the island is open for business. All of the other resorts on the island as well as local bars and restaurants are open now and doing great. Some updates as I was told on the call: Updated lobby areas, refreshed wedding and other gazebos, new pool areas and I’m excited to see this beautiful resort back in action soon!!! Voted World’s Best Beach again this year – it is stunning and pictures do not do it justice! Home to the World’s 3rd largest barrier reef making it a top spot for divers – Beaches Turks & Caicos is an all inclusive resort but also offers a full line of watersports, both non-motorized such as Hobie Cats and Paddle Boards but also Scuba, Snuba and Snorkeling. Beaches Turks is the busiest water sports center in the chain of Beaches & Sandals Resorts and has 11 boats in their fleet including the Newton Dive Boats which are tops in the industry. 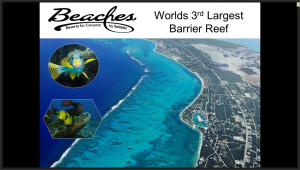 Certified divers are given the chance for unlimited dives at Beaches Turks & Caicos which is a huge added value, if you’re not certified, no worries, you can take care of that on resort. For families, this resort is the top of it’s line including Sesame Street characters which now also include Julia who is a 4 year old little girl with Autism and counselors certified by the International Nanny Association in their kids club which provides excellent care and programs from infants up to the hard to please but always happy at Beaches, Teens and Tweens!! New entertainment from Creativiva with live shows four times a week on the main stage in the French Village including Jungle Book, Treasure Island, Alice in Wonderland and Dolce Vita, again all included, no additional charge!! There’s always plenty of entertainment at Beaches Turks & Caicos. 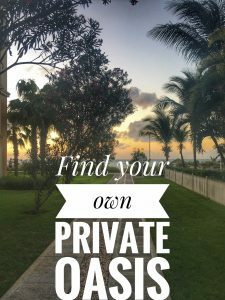 There are over 43 room categories to choose, from luxury rooms to 4 bedroom villas with their own pool so I can help you find exactly the room, suite or villa for just two of you or up to a family of 10 with no problem!! Their top suites include butler service which also includes private SUV transfers from the airport and your personal butlers who will take care of you and your family’s every need. The biggest dilemma you’ll face at Beaches Turks & Caicos is trying to fit in dining at their 21 amazing restaurants during your stay. In addition to those 21 restaurants, you’ll also now find Water Park Food Trucks including Mr. Mac for Mac & Cheese and Curls & Swirls with milkshakes by the water park. I’d be happy to share my knowledge of this amazing resort with you to help you find the perfect accommodation for your family, the two of you for your honeymoon or your group to celebrate a family reunion or destination wedding. Beaches Turks & Caicos is the place to make all your dreams come true!